Master King grow up in the Southern California and started his train in Los Angeles at the age of 12 in the style of “Sticky Hand Kung-Fu “under Sifu Isaac. At the age of 14 Master King and family moved further south to San Diego, Ca. where Master King attended high school at San Diego High School and averaging in his academics and excelled in Sports, Arts and Music. Growing up surrounded by drug houses & gang bangers, Master King saw the martial arts as both a way of life and a good a way of staying out of trouble while trying to better himself. At an early age he knew that he could fight out in the streets and land himself in trouble with the law or fight in the local tournaments and win the rewards of medals, trophies & cash prizes; and even the respect of his peers and local masters of the arts. Master King was blessed to go on and become a local favorite competitor and even champion. In 1992, Master King received his instructors blessing to open up his Martial Arts school (Art In Motion Karate). He and his students continue to compete and win local tournaments in the Southern California area. In winter of 1995, Master King and family moved from San Diego, Ca. to New Jersey where he had to re-establish his Martial Arts school (Art In Motion Karate). In the summer of 2004 Master King returned to San Diego and successfully tested for his 4th degree black belt. Master King was promoted to 5th degree black belt by the E.U.S.A.I.M.A.A. (Eastern United States of America International Martial Arts Association) under Grand Master John C. Kanzler as well as Grand Master Marty Manuel of Vineland, New Jersey. 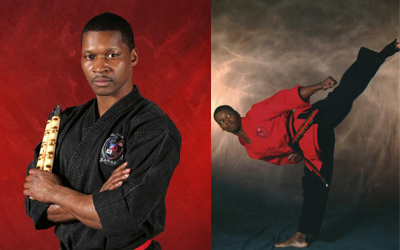 Over the years Master Kings has been blessed to teach not only martial arts but Gymnastic and Tumbling as well. He had been inducted in 5 Hall of Fames (they include not only the Eastern U.S.A. International Martial Arts in Pittsburgh, PA., the 1st Worldwide Martial Arts Hall of Fame in Delaware, PA., the Hall of Honors in Atlantic City, NJ., the World Head of Family Sokeship Counsel in Orlando, FL., and last but not least the U.S.A. Martial Arts Hall of Fame in New York. In his down time Master King enjoys playing bass, drums & keyboard. Master King is very passionate about young people, he understands that they are not only are our future, but they are our here and now! He believes that if we train them with Love, Discipline and most of all, Respect. By training up our children with this winning combination, we will get not only a better today and better yet a better tomorrow!